A5 Cutting mat is placed underneath the parchment paper when cutting perforations. The mat is black and 0,3 cm thick. Embossing is, together with perforating, the basic technique of Parchment craft, because this way you can create the beautiful lace work that is so characteristic for this hobby. Using the correct materials is of utmost importance for this. 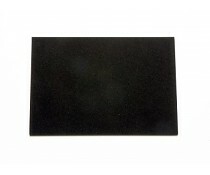 The embossing mat excellent is specially developed for embossing on parchment paper. The firmness and resilience of the material that this mat is made of ensures that you can achieve beautiful embossing work without tearing the parchment paper or having the parchment paper buckle. The mat is suitable for all Pergamano embossing tools and embossing techniques, from stark white embossing work to the beautiful art of shadow embossing. Recommended by the professionals ! "Finally, the perfect embossing mat that has been carefully tested and developed. Now you can achieve beautiful embossing effects using the embossing mat excellent." This blue embossing pad is used to create raised relief in the parchment paper project. The pad is placed under the project and fully supports the paper since it has the correct elasticity for working with the embossing tools.